Teachers often teach on their own in their individual classrooms and thus have to mostly rely on themselves to reflect on their teaching practices and make improvements. This study explores the potential of using a video self-analysis component in an undergraduate technology integration course to help preservice teachers effectively integrate technology into instruction. Specifically, this study explores the impact of video self-analysis on developing preservice teachers Technological Pedagogical Content Knowledge (TPACK). Results reveal video self-analysis was beneficial in helping preservice teachers facilitate their TPACK development. However, participants TPACK development varied within the six TPACK knowledge domains. Over the past two decades, scholars, researchers, and practitioners have shown considerable interest in designing and developing instructional strategies that can help teachers improve their ability to teach with technology (e.g., Hofer & Grandgenett, 2012; Koehler & Mishra, 2005a, 2005b). A teachers’ ability to effectively teach with educational technologies is vital, because studies have shown teaching with technology can help enhance students learning (Beetham & Sharpe, 2013; Gulek & Demirtas, 2005; Wenglinsky, 1998), students’ academic achievement (Cheung, 2013; Lei, 2010; Schacter, 1999), and students’ engagement (Abrami, 2001; Wankel & Blessinger, 2013). The importance and benefits of teaching with technology has been emphasized in many public discussions and national policies. For example, the fourth National Education Technology Plan titled: Transforming American Education: Learning Powered by Technology, was released by the U.S. Department of Education’s Office of Educational Technology (OET) in 2010 (U.S. Department of Education, 2010). This plan called for integrating educational technologies into the entire U.S. education system in order to “enhance student learning, accelerate and scale up the adoption of effective practices, and use data and information for continuous improvement” (U.S. Department of Education, 2010, p. v). However, even with initiatives and efforts designed to help teachers adopt educational technologies (e.g., Preparing Tomorrow’s Teachers to use Technology-PT3, Enhancing Education Through Technology-EETT) (Harris & Walling, 2014); teachers are still not embracing or teaching with educational technologies (Mouza, Karchmer-Klein, Nandakumar, Yilmaz Ozden, & Hu, 2014). 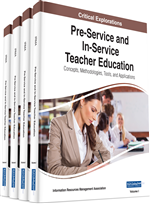 Recent studies have revealed that one major reason teachers are not adopting technology into their classroom instruction is because their teacher preparation programs did not adequately prepare them to do so (Banas & York, 2014; Chai, Koh, & Tsai, 2010). Currently, teacher preparation programs have embraced the collaborative learning instructional paradigm as a means to prepare the next generation of teachers to effectively teach with technology (e.g., Chase Martin & Sadera, 2011; Johnson, 2014). However, the teaching profession has been well documented as being largely done in isolation (Darling-Hammond, L., Chung Wei, R., & Alethea, N., & Orphanos, S., 2009; Lowrie, 2014), and not in a collaborative learning environment (Burke, Schuck, Aubusson, Buchanan, Louviere, & Prescott, 2013; Ingersoll & Smith, 2003). To reflect the realities and solitary nature of the teaching profession, this study examines the use of a video self-analysis component in an undergraduate technology integration course, and explores its impact on facilitating preservice teachers’ Technological Pedagogical Content Knowledge (TPACK). This study will address the following research question: What impact does video self-analysis have on facilitating preservice teachers’ Technological Pedagogical Content Knowledge (TPACK)?